Potential candidates were warned from the start that Ex BACKCOUNTRY SAPPER 16 was to be an Adventurous Training expedition unlike any other. ‘This will not be a jolly.’ the email read and whilst that may have been enough to put many others off, it only appealed to me further. Headed up by Lt Tom Brunstrom, and supported by two military ski instructors, the team of twelve expedition personnel were selected from across the Corps of Royal Engineers. As luck would have it, the line-up was evenly balanced with a mixture of Regular and Reservists of all ranks (mostly from 71 and 39 Engineer Regiment). This cohesion brought a great range of knowledge, experience and diversity to the small group. 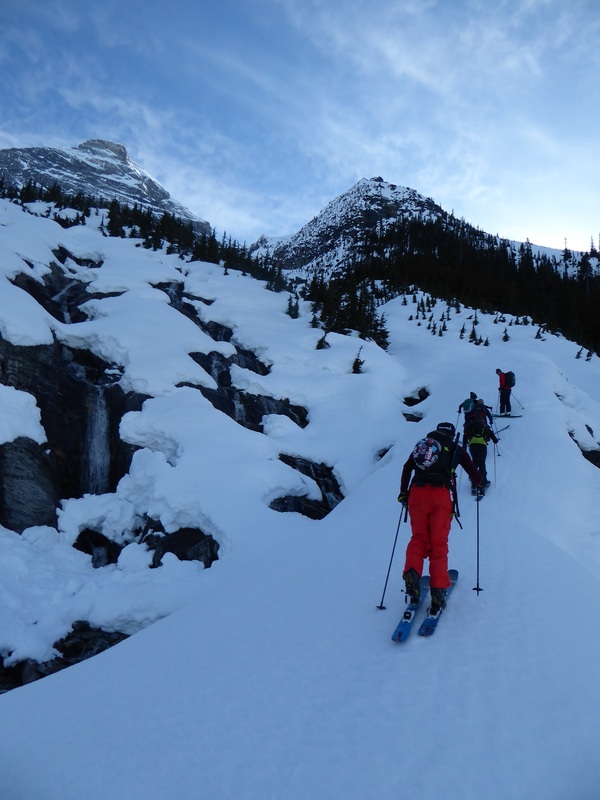 The main effort of the trip was to conduct a backcountry expedition in the vicinity of Banff, Alberta in order to expose the participants to a challenging environment where trust, individual skill and quick thinking would be vital. We set off from Aberdeen on 29th March amid extreme weather warnings and fears that we wouldn’t make it out of the UK, let alone to Canada. Despite almost missing the connection we arrived with some relief, and surprisingly all our luggage, at Calgary Airport. It was here that we were met by members of staff from British Army Training Unit Suffield (BATUS) and our loaned vehicles. Quickly getting used to driving on the ‘wrong’ side of the road, we made our way to what would be our base for the next few weeks, the ideally located and well suited Hi Banff Alpine Centre. 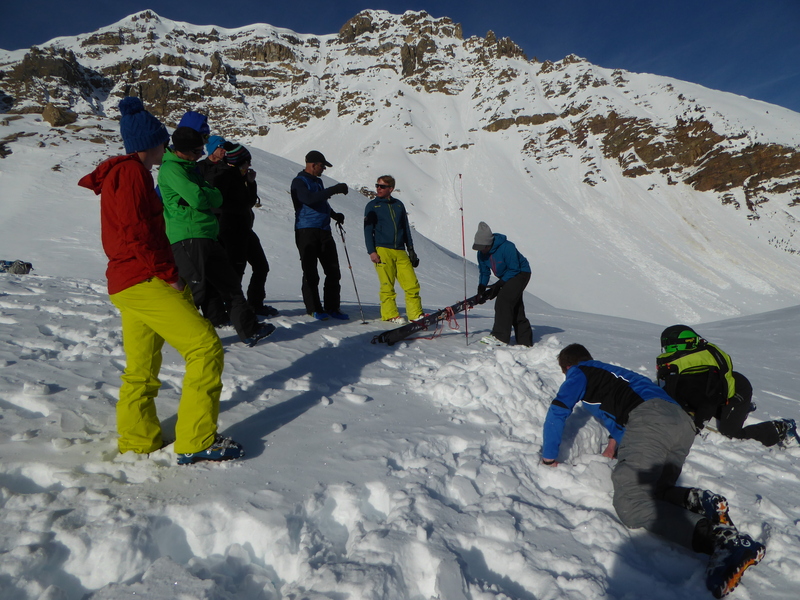 The first and second phase of the trip involved qualifying all participants in the Ski Foundation Level 3 (SF3) course. For those who had previously gained this, time was utilised developing their own ski, or more specifically jumping, techniques. The first phase was carried out in various famous resorts around Banff, including Sunshine and Lake Louise. 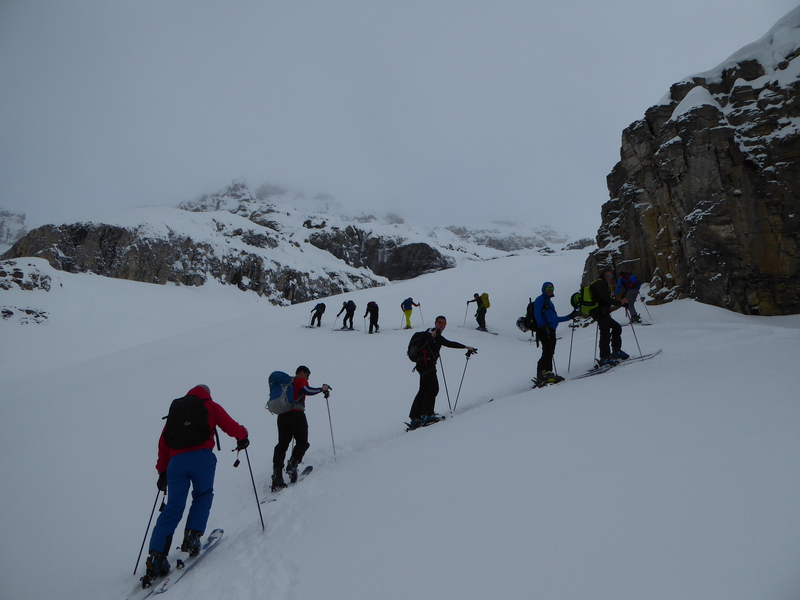 Gaining the SF3 qualification not only allowed individuals to build confidence in their abilities before embarking on the expedition phase, but it also permits holders to move onto the Ski Leader qualification, making them an asset for their respective units. The second phase involved making fresh tracks into the back country for three single day ski tours. Backcountry skiing, is skiing on unmarked or unpatrolled areas often in remote areas well away from the confines of a resort. This contrasts immensely with the discipline of alpine skiing which is found on groomed trails, serviced by lifts and benefits from a dedicated ski patrol. Backcountry skiing requires individuals to be self-efficient as well as extremely aware of their surroundings at all times. Being confident in your knowledge, skill and decision making is vital due to the constantly changing hazards involved. 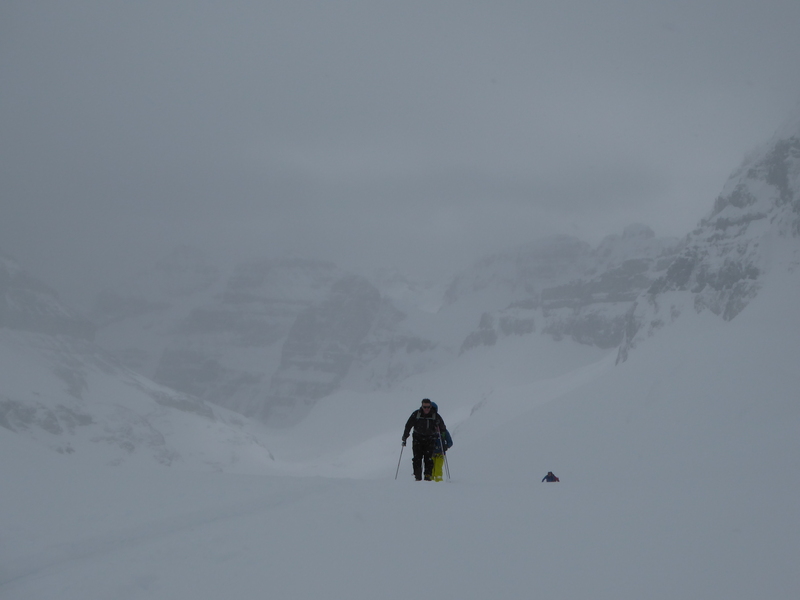 We trained to prepare ourselves for the worst of these; avalanche, injury, bad weather and difficult terrain. 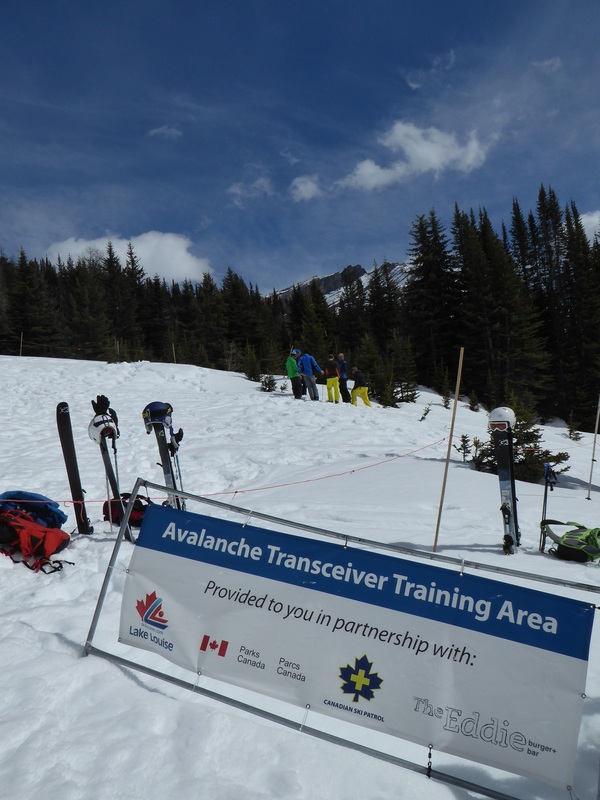 Utilising the specially built Transceiver Training Parks we spent hours simulating avalanche and crevasse rescues, learning snow profiling techniques and settling into our two expedition teams. These essential few days allowed us to fine tune our procedures as well as iron out any last issues with our kit. 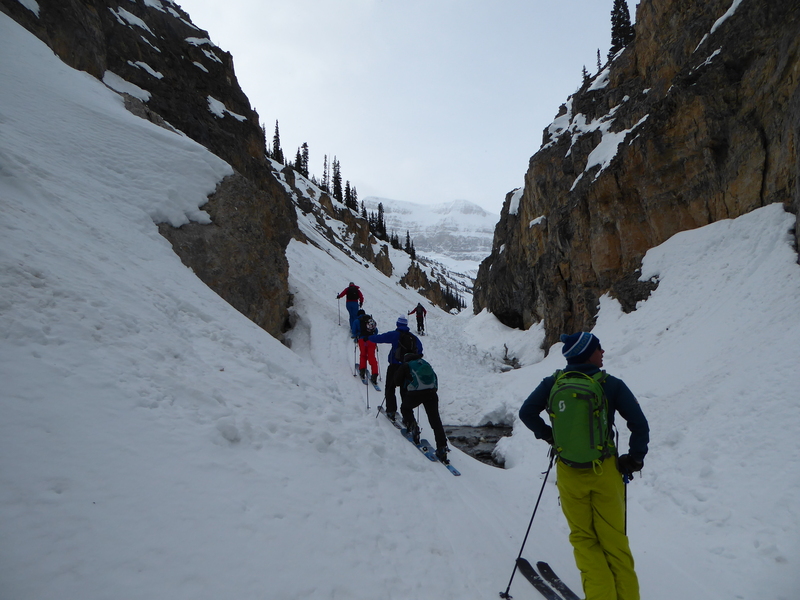 These ‘warm up’ tours included a hike up Bow valley, a long skin up Chickewa Valley in brilliant conditions and a slightly shorter tour along the lower slopes of Bow Valley Ridge providing some great runs down through the trees. 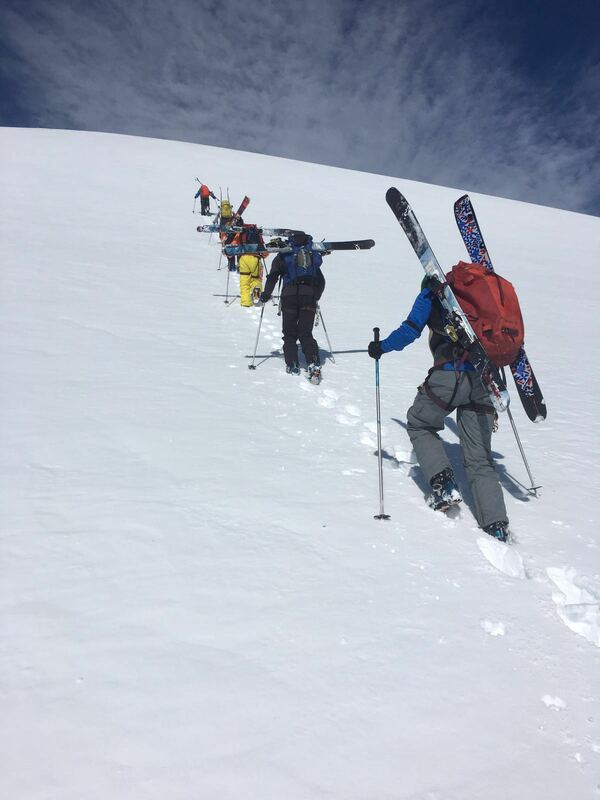 Touring days typically involved 6 – 8hrs of skiing covering over 25km of skiing and up to 1000m of ascent. 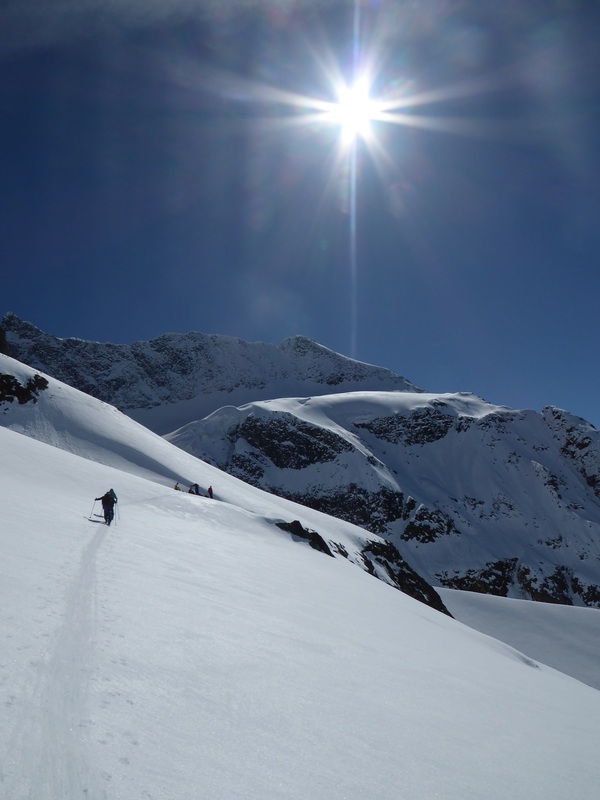 With Go Pro’s fully charged and a weeks’ worth of peanut butter bagels packed safely in our bags, our two expedition groups went their separate ways and entered the third phase of the expedition – multi day ski touring from mountain huts. 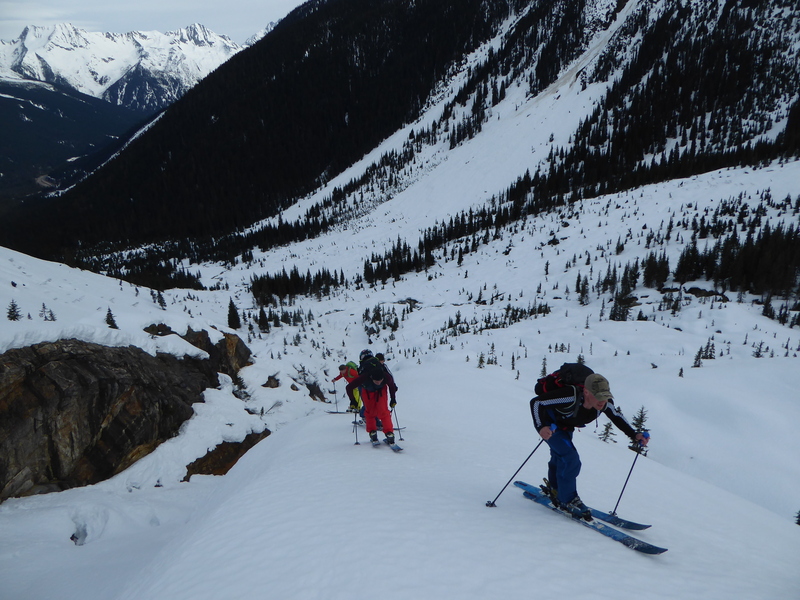 The first group, led by distinguished mountain guide, avalanche expert and author Mark Klassen, tackled various routes from the Wheeler Hut in Rogers Pass. Over the course of four days the group covered areas including the Illecillewaet Valley and Glacier, Sir Donald, Lookout, Asulkan Pass and Asulkan Glacier. The weather was fantastic and the snow pack deep, providing unbelievable spring skiing on some pretty challenging terrain both up and down the mountain. Touring skins are a fantastic piece of equipment and allow you to gain traction on steep snow as you ‘tour’ uphill. Just how steep you could go before you started to slide the other way was a matter open to experimentation. Whilst touring beside the stream up the Asulkan Valley one member of the team selected a deceivingly steep section and after sliding back down using their nose as a break was only centimeters away from taking a bath in the inviting glacial melt water. 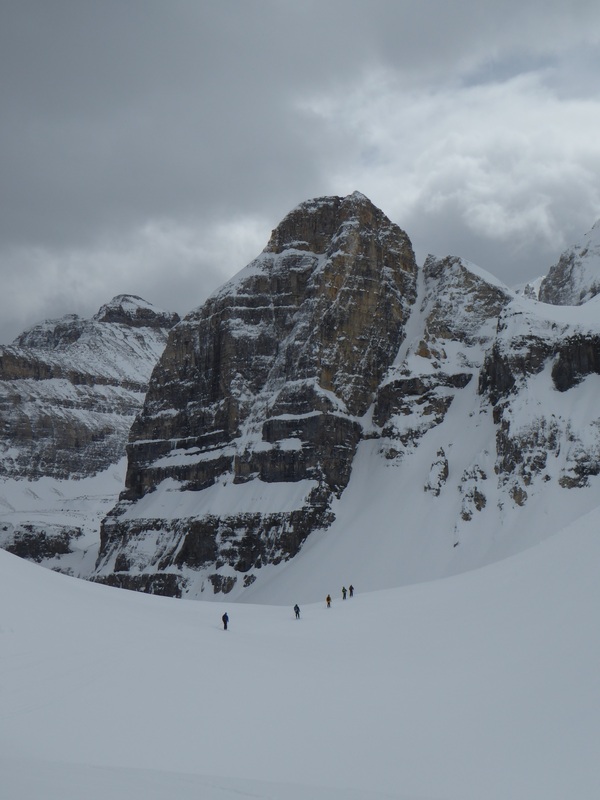 The second group, led by another extremely accomplished local guide (Todd), took on the famous Wapta Icefields from the Bow Lake Hut. The group completed a circumnavigation of Mt Gordon as well as conquering the peak itself and the nearby Mt Rhonda. The ascent of Mt Rhonda was a memorable tour as accessing the bottom of the climb involved a long but quite flat descent from the nearby St Nicholas Peak. One member of the team let the pressure get to them and took a fall right at the start of this descent. They then had to re-apply their skins and walk the entire slope to rendezvous with the group. The ascent itself involved an ever steepening slope which cumulated in the team having to remove skis and ‘boot’ their way up the final pitch. The challenges didn’t stop once we returned to our respective huts however; as both groups learned how to survive again without the modern conveniences we all take for granted. The modest, traditional wooden huts may have lacked the comforts of electricity and running water, but more than made up for it with their rustic charm, wood burning stoves and presence of an unconquerable 1000 piece Trevi Fountain puzzle. Whilst the Wheeler Hut group desperately tried to complete the seemingly endless puzzle by gaslight, the Bow Lake Hut group found themselves playing cards late into the evening. As expected, the stakes were high with the top prize being the chance to get towed back across the dreaded 2km stretch of Bow Lake on the last day. With the expedition phase coming to an end we were eager to make the most of our time left in the country. With the countless opportunities open to us throughout our visit, we used every spare moment to get out and explore. We visited the local Hot Springs; a few members opted to go Heli Skiing, others took a road trip to Fernie; we saw the World’s Biggest Truck (TEREX TITAN); watched an Ice Hockey game and of course, enjoyed a final group meal in the local Steakhouse. With our last Tim Hortons coffee stop, a few extra items of hold luggage and the bitter disappointment of not spotting a single bear, we said goodbye to a snowy Banff. Like so many others, this expedition would not have been possible without the hours and hours of organisation and planning put in beforehand by Lt Brunstrom and Sgt Jones, to whom the entire group are incredibly grateful. We’d also like to thank the Ulysses Trust whose generous funding and support allowed us to facilitate our trip.